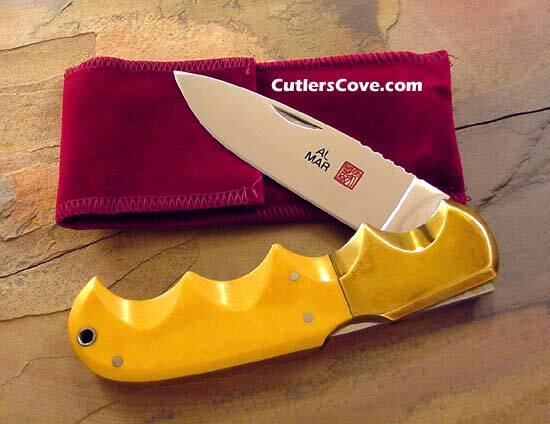 Al Mar Buzzard ivory Micarta front-lock. It is near mint without the box or sheath but it does have a felt pouch. It is really mint with very light marks on the bolster and it has not been sharpened. The blade is 3-5/8" and it is 4-3/4" closed. Model 1006 is a early Al Mar not a current one. It has the exceptional, high carbon, stain-resistant steel RS 30 which was developed especially for Masahiro Cutlery in Seki, Japan. Get it before it is gone!